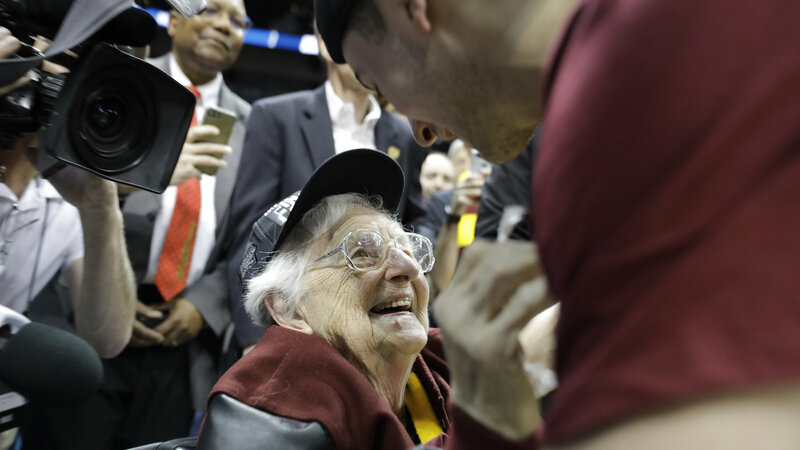 With 41 seconds left in Loyola-Chicago’s Sweet 16 game with Nevada, Sister Mary Fran McLaughlin points out just how close the game is — just like Loyola’s two previous games in this unexpected NCAA Tournament run. “There’s our girl!” said Sister Peggy Geraghty as the camera pans to a friend they’ve known for 50 years. Sister Jean Dolores-Schmidt, a fellow BVM and the chaplain for Loyola’s men’s basketball team, is greeting well-wishers at the game in Atlanta. Jean Dolores as they call her, has become the runaway star of the Ramblers’ run, which thanks to a 69-68 win over Nevada has extended to the Elite Eight, and Saturday to the Final Four after their victory over Kansas State.